On many occasions conventional DVD players aren't capable of reading more formats than the standard ones designed for this kind of device: DVD-Video. 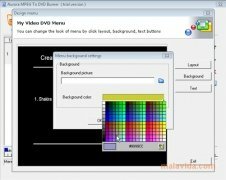 Unfortunately, your ripped DVDs and downloads are hardly ever in that format, something that obliges you to use a converter that makes it possible to view the contents on other domestic devices as well as your computer. What's more, the software has a very simple and functional interface, that makes it easier to use. It is even possible to configure different skins and choose the one that you like most, so that the customization options are many.